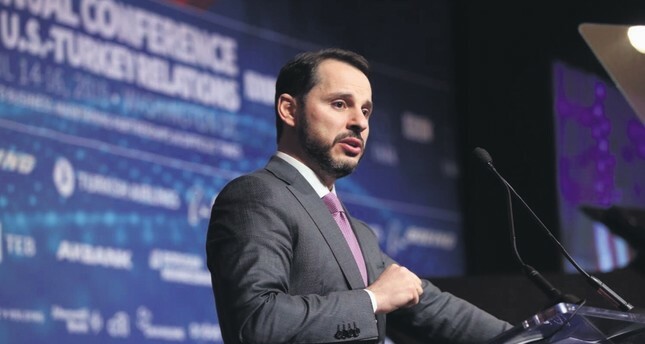 Treasury and Finance Minister Berat Albayrak addressed Turkish and American businesspeople and politicians during the 37th Annual Conference on Turkey-U.S. relations in Washington D.C., April 15, 2019. Ankara and Washington once again reiterated their commitment to building upon their economic partnership and strengthening partnership within the framework of NATO. During a series of meetings held as part of the 37th Annual Conference on Turkey-U.S. Relations in Washington D.C., Turkish and American ministers and businesspeople from both sides had the opportunity to emphasize the historical partnership and devise a new vision for the bilateral rapport for the upcoming period. During his address at the gala dinner of the event organized by the Turkey-U.S. Business Council (TAİK) of the Foreign Economic Relations Board (DEİK) and the American-Turkish Council (ATC), Treasury and Finance Minister Berat Albayrak stressed that the historical depth and the institutional strength of the Turkey-U.S. security alliance within NATO constitutes the foundation of bilateral ties. Albayrak drew attention to the fact that the changing international setting has affected Turkish-American ties. "The alliance between our two great nations has undergone a number of tests in recent years. While the U.S. is redefining its global role and regional position, Turkey continues its efforts to maintain its own national interests," he remarked. The treasury and finance minister pronounced that economic relations should serve as the stabilizer for bilateral rapport and financial ties between the countries must be just as robust as our traditional security partnership. In reference to the economic ties, Albayrak said: "They should play a more active role in determining the future of the relationship between the two countries. I realize this is easier said than done. But I want to assure all of you that this is our vision." Albayrak noted existing strains in bilateral relations between the NATO allies but said they should not "prevent us from looking to the future with a positive outlook." "Let us avoid threats of sanctions and games of brinkmanship and work on creating a realistic yet positive agenda," he added.In the last couple of years, Turkish-American bilateral ties have seen dramatic fluctuations due to persistent issues that the two allies have to look into and resolve. Issues, including Syria, the S-400 missiles and the extradition of Fetullah Gülen, the mastermind of the July 15 coup attempt orchestrated by the Gülenist Terror Group (FETÖ), have led to mounting tension between the two partners. Aware of the high stakes, neither side has resorted to cutting ties but has maintained dialogue in multiple spheres, particularly on the economy. "The emerging security threats in the region, new geopolitical and geo-economic risks compel us to diversify the cooperation between our nations," Albayrak said, maintaining that Turkish and American leadership have played significant roles in the resolution of the crises in the last decade. In his address to a gathering of Turkish and American business circles, Albayrak elaborated on Turkey's economic policies and their goals. "There is probably no better time to invest in Turkey," he said, pointing out that Turkey has entered 4.5 years of a period free from elections. Albayrak stressed that the no-election period and the swift decision-making capability of a strong government offers investors great opportunities to capitalize on. The minister also noted that the reformist agenda will bring in a new economic perspective to increase growth potential in the long-run. Doctrine in the aftermath of World War II. While the strategic political and military cooperation expanded with Turkey's membership in NATO in 1952, the economic partnership grew more exponentially as Turkey welcomed more American companies. Currently, 1,853 American companies operate in Turkey's retail, e-commerce, finance, energy and technology sectors. The U.S. also ranked second in Turkey's foreign direct investors with $11.8 billion in the period of 2002 to January 2019, according to the foreign direct investment (FDI) statistics released by the Industry and Technology Ministry. It is reported that U.S. direct investment in Turkey is led by manufacturing, wholesale trade, finance and insurance. Although overall U.S.-Turkey bilateral trade jumped from $10.8 billion in 2009 to $20.5 billion in 2018, it remains modest compared to its potential. Therefore, President Recep Tayyip Erdoğan and U.S. President Donald Trump agreed to raise the trade volume to $75 billion. Treasury and Finance Minister Albayrak was also hosted by U.S. President Donald Trump in Washington, Albayrak said on Tuesday. "During our meetings with U.S. Secretary of Treasury Steve Mnuchin and [Trump's] senior adviser Jared Kushner to discuss the steps for boosting cooperation, we were hosted by U.S. President Donald Trump in Washington," Albayrak said in a statement. "We conveyed the greetings and messages of our president [Recep Tayyip Erdoğan] to him [Trump]," he added. Albayrak also shared his impression on Trump's stance on Turkey's planned S-400 purchase, which is likely to be delivered in June, earlier than the initially set deadline of July. "He listened in a very reasonable way with a positive understanding to the process regarding Turkey's needs for the S-400s," Albayrak said in the statement. "There was a very positive, constructive conversation." Albayrak was also cited as saying there were discussions at the meetings on increasing bilateral trade between the United States and Turkey to $75 billion annually from $20.5 billion currently. The recent visit to the U.S. to meet various funds and investors has been the most successful so far, Albayrak said yesterday in a statement, noting that the Turkish economy is on the right track despite negative media abroad. "When we look at the returns from each investor meeting, we began meetings by getting largely praised about the effect of the last six to seven-month performance," Albayrak told reporters, adding that the JPMorgan investors' conference had the largest attendance ever. Albayrak noted that the Turkish economy faced large challenges seven months ago, stressing that the improvements in the 2018 year-end and 2019's first quarter were quite successful. "We have to put forward a strong performance by taking important lessons from these processes and eliminating vulnerabilities. I feel very comfortable in that sense. Turkey is moving toward its goals step-by-step." "There will always be people and institutions friendly and supportive of Turkey, as there will be those who are against [it]. There will be those who love Turkey, as there will be those who are uncomfortable with it," Albayrak said, adding that Turkey is moving toward a system operating like clockwork against disinformation. The minister said a possible rerun of local elections in Istanbul, disputed between the ruling Justice and Development Party (AK Party) and main opposition Republican People's Party (CHP), was not among the concerns conveyed in official meetings and only a couple of investors asked questions on this matter. Investors were mainly interested in the upcoming 4.5-year period without elections, Albayrak said, saying that markets made their moves for all possible outcomes in the elections. "We will continue working to ensure an investment environment to boost investor confidence," he concluded. Albayrak has been in Washington D.C. since last Thursday, his first official visit to the U.S. capital since he took charge of the economy last July. He held a series of investor meetings and attended the International Monetary Fund (IMF) and World Bank spring meetings.